The ongoing Destiny 2 Invitations of the Nine bounty chain recently led inquisitive players to Io for The Magician bounty. This bounty requires you to complete the Pyramidion Strike on Io and kill Cabal, Taken, and Vex to collect samples. The trouble is, as you've probably already learned, Cabal are hard to find on Io. Here's the good news: Cabal do in fact dwell on Io. They don't roam around much, but hordes of them will spawn in during the Cabal drill Public Event which appears in the Rupture and the Lost Oasis. These events can be few and far between, though, so you'll probably want a more reliable method. This leads us to the better news. I don't know if the Invitations of the Nine are bugged or just poorly written, but the fact of the matter is, you don't have to collect samples in the locations they specify. You can kill the necessary enemies virtually anywhere and still earn samples. At the time of this writing, we're four invitations deep, and players have been able to complete all four of them all over the solar system. 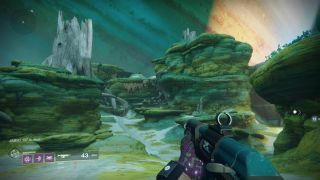 The Magician invitation is no exception, so while you could hunt down pockets of Cabal on Io, you could also go to Mars or the EDZ or any other Cabal-dense area. Guess which method I'd recommend? Until Bungie updates the instructions on the invitations or - gulp - disables off-planet samples, this method is perfectly valid for all invitations. So go nuts and cheat the system a bit, I say. I'm still not sure if this sample thing is a bug, but it's not in the latest Destiny 2 patch notes, I can tell you that.